This wall mount is customized for Mi/ Yi Home Camera (1080p/720p). It is easy to install your home camera to the wall mount as the great buckle design, also easy to install the wall mount to the wall with various accessories. 360 degree rotation provides a best viewing experience. 1.Use screws to fix the camera on a wooden wall directly. 2.Use the magic sticker to mount non-drywall surfaces ( you'd better paste it on glass ). 3.Nail the screw anchor into the wall first and then mount your camera to the wall with screws. Package include: 4x wall mount, 12x screw anchor, 12x screw, 4x magic sticker. 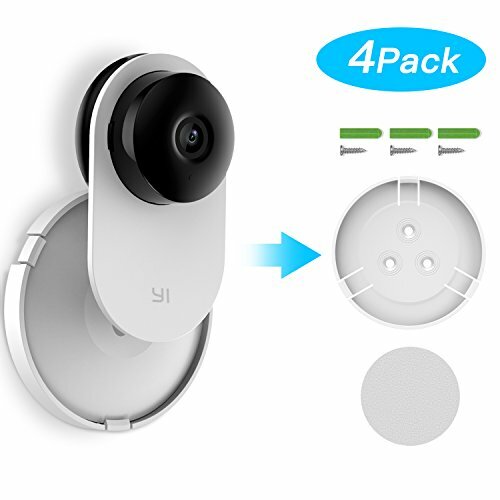 【Perfect Fit】Specifically designed for Mi Home Security Camera and Yi Home Camera (1080p/720p). 【Easy to Install】 Buckle design, non-destructive installation, will not damage your home camera, fully 360 degree rotation allows you to adjust your camera to point anywhere you want with any angle. 【Optional Methods of Installation】Come with screws, screw anchors and magic stickers, provide various methods to mount the home camera. You could mount your Home Camera to the wall with the screws, or mount it with the magic sticker. 【High Quality】Made of durable ABS plastic material, it can fix the security camera in the living room, the baby room, the garage, the balcony or anywhere you need. If you have any questions about this product by Kasmotion, contact us by completing and submitting the form below. If you are looking for a specif part number, please include it with your message.